In the fall of the year David and I sat down at our dining room table in Georgia and I laid a copy of Sigfried Engleman’s Teach Your Child to Read in 100 Easy Lessons on the table between us. “David, it’s time for you to learn to read. Are you ready?” Boy, was he ready. David had been determined, since he was four, to learn to read. His brother, whom he idolizes, read late into the night every night, using the special flashlight he had earned on completing his 100 Easy lessons and David, laying on the bunk below, couldn’t wait to bask in the glow of reading. For ten months David read almost every day. He would start reading on the floor, book spread in front of him, then half way through he would groan, and put his hands on his back, leaning back like a little old man, and say “Oh, my back!” Then we would move to an easy chair, with him curled up on my lap while I held the book. David learned to be careful tracking as the text shrunk and the lines grew closer together. He learned the special sounds made by the various blends and, his favorite, he learned about quotation marks: “now we’re going to find out what he said!” Reading didn’t come with remarkable ease for David. Sometimes we took breaks from the 100 Easy Lessons, which David insisted we needed to change to “100 Hard Lessons,” and read other things until he was ready to go on, but through it all David was the most determined young reader I have ever seen. He didn’t complain, he didn’t put his head down and give up, he just kept reading- sounding out, back tracking, and completely making things up when he got too lost. We finished the school year at the end of May and he still had a dozen lessons left to go, so he just kept reading. Finally, on Friday, David finished his 100th lesson! “This is the last end,” he read, as we all sat around our table in our dining room in Seoul, Korea. The family cheered as Kenny turned off the video camera and we presented David with the gifts that have become a tradition for this first rite of passage in our family: a cookie sheet with the number 100 made out of gummy bears, a small gift (Pokemon cards in his case,) and the coveted flashlight. Kenny picked out David’s flashlight: a smaller version of the lights soldiers use with an L-bend in the neck and interchangeable color lenses for signaling. It was perfect for our little warrior. 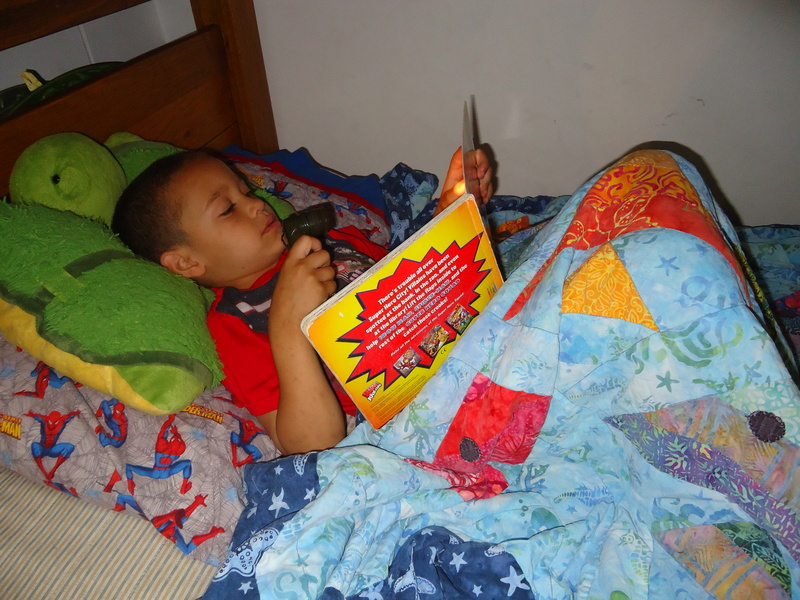 David raced to bed that first night and read a super hero book. Then he hopped out of bed and went to his sister’s bed and read her a Biscuit book. Eventually, we told everyone to turn off the flashlights and go to sleep, but since he learned to read David has carried his flashlight everywhere- Sonlight Kid’s Camp, church today, the bathroom- and read everything he can find. It makes me feel joyful to see him enthusiastic about one of my favorite past times, but more than that, I’m grateful to God for the character David showed while learning to read. He was determined, and joyful, even though the task was sometimes frustratingly hard. I’m so excited to see how God will grow this character in David and how He will turn David’s new skill into a tool for building his relationship with God. Welcome to the world of readers, my little joy!